After this, you’ll never look at these logos the same. You’ve probably seen a few of these, but I guarantee that there’s at least one you’ve never seen before. If not, I’ll PayPal you a dollar for being so awesome. Plus, I found something new in the FedEx logo. Here are 21 famous logos with super-insane hidden messages that’ll blow your mind! Try to find the hidden symbolism before you read the descriptions. Looking for a logo designer? Find and hire a top-notch logo designer here. All of these logos are trademarked by their respective organizations. The arrow makes a smile and Amazon sells everything from __ to __. The logo is an “F” for Falcons. Everybody knows Baskin Robbins has “31” flavors. The Big Ten welcomed their 11th school, Penn State, in 1990 and didn’t want to change their logo. The black is the letter “F” and there’s a “1” in the negative space. Do you see half of a happy face or do you see a “g”? There’s a knight in armor with a spear in the middle of the “K.” But if you look closely you can also see the head of a horse. There’s a bicyclist in that logo. Hint: The yellow is a wheel. Some speculate that the logo for Life’s Good is inspired by Pac-Man. What do you see first? The initials “LSO” or a conductor with a wand? NBC’s logo is a forward-looking peacock that incorporates the six primary and secondary colors in its feathers. The six feathers symbolize NBC’s six divisions: News, Sports, Entertainment, Stations, Network, and Productions. You probably see an “N” in a circle. But the triangle makes a “W” for “west” and it points northwest. Roxy is a clothing brand for women owned by Quicksilver. The logo is comprised of two Quicksilver logos to make the shape of a heart. The Sony Vaio logo symbolizes the integration of analog and digital technology. Th “VA” forms an analog wave and “IO” represents a binary 1 and 0. The “T” is the bottom-side of a driver. Do you see the two people enjoying the chips and dip? Same image rotated 90 degrees to the left. If you’re having trouble seeing the fifth face, blur your eyes. After seeing how cool a logo can be, maybe your company needs a new one. Find and hire logo designers on AwesomeWeb. It’s a company I co-founded in 2014 and we’re taking over the world … of freelance marketplaces. If you liked the article, “Like” it below to share it with your friends. If you don’t think your friends will like it, give it a +1.. This article is awsome! I knew FEDEX but I didn’t know others. I think these company’s strategies make us potentially useful. I will come here again . Hey Kazuki! Good to see you here. Yeah, I like these types of things. It’s neat to see how creative people are. I loved this article but where are the other partyers in the tostitos logo? I have to know! Hey Katie! There are only two partiers in the Tostitos logo. They’re the middle two t’s. Thanks, Henry! How’d you find it? Ah, you almost had me. Goodwill and Knight were two that I noticed just driving around. Now I look for these types of logos everywhere. This logo may not be famous yet, but I like it. Haha… Sure did, Linda. I remember seeing that as a kid and thinking it was the coolest thing! Also in the Toyota logo, you can make out a T. And also in the Lexus logo, there’s an L.
Have you started to take a closer look at every logo you see, Daniel? I do, almost to a fault. 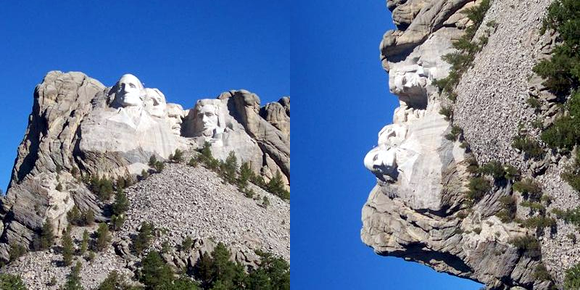 Given that the sculptor of Mount Rushmore was Gutzon Borglum and some argue that he “allegedly” wanted his face as the 5th face, but was told not to… then this could certainly be a way to “get what he wanted” anyway. Wow! Thanks for the info, Najmah! I’d say there’s a resemblance. Missing the mustache, though. I have seen all of these. Will you really make good on your statement? Hmm… That’d be hilarious if Mayflower intended it to be that way. I’m not convinced though. Thanks for sharing, Brian. The LG is an L and a G…look closely. I enjoyed viewing all of them. I knew about the peacock for NBC but not what the different colors stood for. My dad worked for Northwest Airlines so I knew that one. Everything else was intriguing but I still couldn’t put my finger on who the mystery face is on the last image. It kinda looks like Lincoln but he’s already on the mountain……hm. That’s what I was thinking, Rita. Perhaps we need to find someone who looks like that and make them president. With that head of hair and a thick beard….may be a bit passe…..Unless we go Amish for our next President. Haha. Milwaukee Brewers: The baseball in the glove is not a normal looking baseball. I do not see significance in it. Does anyone else? Why not make it look like a regular ball? Must be some reason other than just artsie-fartsie, smanchie pants. I’m not sure, Dan. Didn’t notice it before. Like you said, I’m sure there’s a reason. Canon, the “o” is the shutter. hey nic…. you gave us amazing facts..i am 20 year old chic living in indore, madhyapradesh , india….n you’ll be proud to know that there is a local newspaper dainik bhaskar…they have db star as their promoting newspaper…they share your logos in that newspaper once in a week…. and people do appreciate it! That’s great, Samiksha! Thanks for letting me know. I want to make you notice that in “toblerone” logo, the mountain has a face of a person with open mouth or a horse standing on back 2 feet…see it carefully..
I’ll will be glad if I deserve 1dollar for it.!! Hey Kashyap, I should’ve been more clear in my description. The “horse” in the background is a bear because the company was founded in “The City of Bears.” The deal was if you had seen all of the logos. Ah, there’s a good one. Haven’t seen that before. Thanks, Noax. Love the SUN logo – always thought that it was SUN but now notice that it is UN only… great collection!